A few years ago we put together a vision statement using Stephen Covey’s online vision statement generator and came up with this statement. “As a family we are at our best when we work together. We pray for and encourage one another, enjoy each other and the world God created. We help others by serving, teaching, praying for and loving them. Joy, learning and rest fill our home. We are generous, honest, rely on the Bible and the Holy Spirit. We trust and have grace for one another. I happened to be taking the one of the only online class I have ever done (it was a good one though….). It was a poster making class by Jessica Sprague and I created this poster for one of the assignments. Sadly, it never got framed or even printed, but I feel a slight satisfaction to be sharing it here! No longer getting dusty in the depths of the hard drive, but out for the world to enjoy 🙂 Okay, maybe a bit dramatic, but you get the picture! 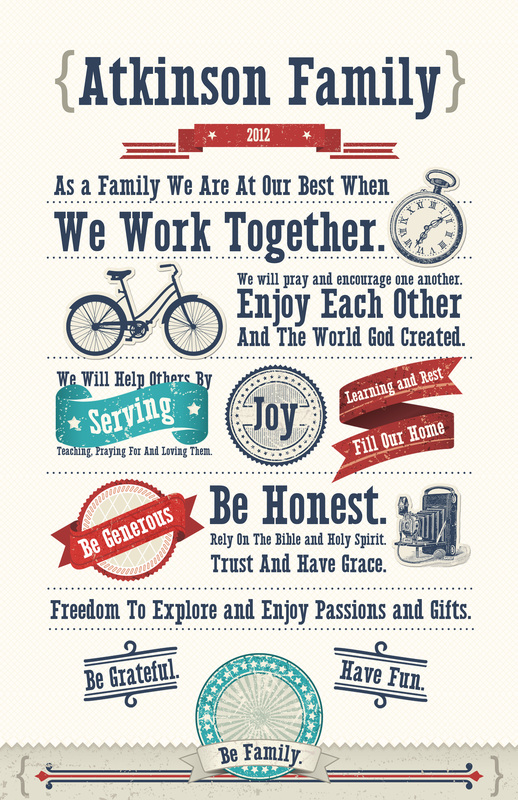 We are going to be revisiting this vision statement as we think about this next season of life, family and ministry, but I think many things will stay the same (which is good, because I probably can’t remember how to change things on the poster!!). Thanks so much Sara!! Happy trails! !